The single phase SG3 represent the latest innovation in ZIVAN's product range. 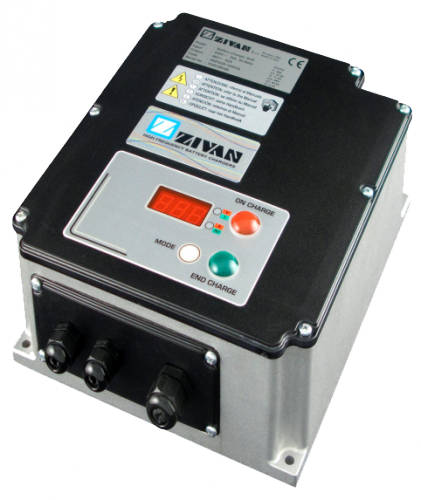 This rugged high frequency battery charger is sealed to IP65, and housed in a strong diecast aluminium enclosure. Thanks to IMS technology, its small size, and a vibration-proof structure, it can be easily integrated into the application as an on-board charger. The powerful flash microcontroller, with integrated CAN-BUS interface, enables communication with other devices such as the controller, BMS, PC, display, etc. ; allowing integration into the most advanced systems. The SG3 properly applies the correct charge curve for all different battery types (Gel, Li-Ion, LiPo, NiMh, Pb, etc. ), with standard factory curves. The supplied diagnostic tool also allows for any charge curve modifications for your custom designed battery pack. The SG3 has the capability to save up to 1000 charging cycles to monitor the behaviour of the battery. Through the Clock Calendar option, it is also possible to date all events for charge history analysis.